If the Flyers are somehow able to survive the annual Stanley Cup endurance marathon as winners, is there any doubt Chris Pronger (despite some issues in Game 5) would be the Conn Smythe Trophy winner? We can applaud the efforts of goalies like Boucher and of course Leighton who weren’t even expected to carry the load when this long season began last October. And there’s no doubt Mike Richard has emerged fully as a team leader, Gagne has overcome injuries to score key goals, Hartnell has played with grit most nights and the list of Flyer mucker/contributors is lengthy. Not surprising, for a team that has advanced this far. But Pronger is the straw that stirs the drink, as baseball great Reggie Jackson said many years ago about his own role with the New York Yankees. It’s been said often but it’s true: in recent years, wherever Pronger has gone, he has made his team that much better, the most obvious examples being Edmonton and Anaheim and now Philadelphia. 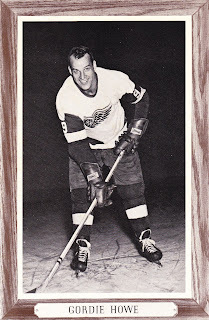 So how does Pronger remind me of the legendary Gordie Howe, who played an entirely different position? Well, unlike Pronger, Howe was a right winger for the Red Wings. But in his hey-day, through the 1950s to the early 1960s, he, like Pronger, was a force. Big for his era at 205 pounds, Howe was naturally strong and probably never lifted a weight in his life. He had a few fights early in his career that made virtually everyone stay away from him for the last 15 years of his illustrious career. Honestly, I can rarely recall him hitting guys in open ice like some players do today. But he was rugged in the corners and along the boards, and was of course famous for his occasional elbows smashes. Sometimes he’d get caught, but most often he would wait until the referee was looking elsewhere to deliver his pay back to a player who may have annoyed him. Howe wasn’t overly fast as a skater, though he was powerful and could move well. He was almost always in control, measured almost, in his style of play, rarely reckless or out of control. He could pace himself, which was necessary because I swear he played 30 to 35 minutes a game, sometimes more. I realize things were different in the ‘50s and ‘60s, as there were only three forward lines and coaches didn’t change lines every 40 seconds as they do now. It was a slower-paced affair. Similarly, Pronger is a big man for his era, and may be the dirtiest guy on skates in the NHL today. Howe had a reputation for being a nasty player, though he usually left you alone unless you bothered him first. Pronger doesn’t wait to be annoyed. Like Howe, Pronger doesn’t have to fight, really. He hits guys, and uses his stick like few others while bending and often breaking the rules. But he, much like Howe, can also conserve energy, which enables him to log big minutes. And like the Red Wing great, Pronger can make smart, simple passes, and play an economical game. Howe could on occasion shoot with both hands, though that skill was overplayed. (I did see him switch hands on a breakaway and score a beautiful and important goal on the second-last day of the 1969-’70 season against Eddie Giacomin to clinch a playoff spot for the Wings.) He would often play on the point on the power play, which Pronger obviously does because he is a defenseman, can shoot well and sees the ice well. Howe wasn't the fastest thing on skates, nor is Pronger, But Pronger is powerful and gets where he has to go most of the time, just like Howe did. The Flyers may not win the Cup, but Pronger has played a huge role in getting them this far.